The NewsLine: Black rhino declared extinct. No wild black rhinos remain in West Africa, according to the latest global assessment of threatened species. The Red List, drawn up by the International Union for Conservation of Nature (IUCN), has declared the subspecies extinct. 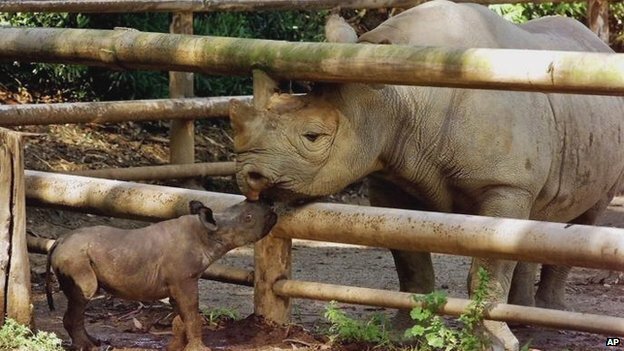 A subspecies of white rhino in central Africa is also listed as possibly extinct, the organisation says. The annual update of the Red List now records more threatened species than ever before. The IUCN reports that despite conservation efforts, 25% of the world's mammals are at risk of extinction. As part of its latest work it has reassessed several rhinoceros groups. As well as declaring the western black rhino (Diceros bicornis longipes) extinct, it records the northern white rhino (Ceratotherium simum cottoni), a subspecies in central Africa, as being on the brink of extinction. The last Javan rhino (Rhinoceros sondaicus) outside Java is also believed to have disappeared. Overall numbers of black and white rhinos have been rising, but some subspecies have been particularly vulnerable to poaching by criminal gangs who want to trade the animals' valuable horns. Simon Stuart, chair of the IUCN Species Survival Commission, told BBC News: "They had the misfortune of occurring in places where we simply weren't able to get the necessary security in place. Among the success stories identified in the latest annual update is the reintroduction of the Przewalski's horse (Equus ferus). Listed extinct in the wild in 1996, it was brought back after a captive breeding programme and the wild population is now thought to exceed 300. Among the partner organisations involved in compiling the research for the list is the Zoological Society of London (ZSL). ZSL's Dr Monika Boehm said: "This Red List update very much shows us a mixed picture of what's happening to the world's species. There's some good news and some bad news. "Unfortunately, the overall trend is still a decline in biodiversity. We still haven't achieved our conservation potential."